The 2018 Audi A4 sedan here compares to the superb and powerful 2019 Infiniti Q50 that you can admire and especially try at your Spinelli Infiniti dealership. We present you here 2 very attractive and refined luxury compact sedans, with a rather sober look, but both of which have impressive characteristics, in terms of safety and comfort as well as technology. 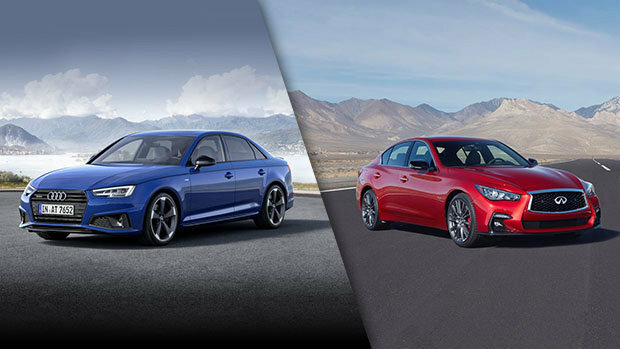 Here's the 2018 Audi A4 and the 2019 Infiniti Q50, which can be seen at your Spinelli Infiniti dealership in Montreal, in the West Island, easily accessible from Montreal East and Laval. Even if they are intended to comfortably accommodate and safely carry passengers to their destination, one of our two participants in this brief comparative has remarkably effective athletic abilities. It is the 2019 Q50, whose fiery engine was named one of the top 10 engines in 2018 according to Wards. In fact, it offers 2 engines, either a 2 V6 3.0-litre Biturbo, one of which exudes the tremendous power of 400 horsepower and 350 lb-ft of torque, and another, wiser one, with 300 horsepower for 295 lb-ft of torque. Without wanting to denigrate the German manufacturer, the 2018 A4 relies on a 4-cylinder turbo of 252 horsepower and 273 lb-ft of torque. Both of them offer 4-wheel drive, and for more efficient driving according to the conditions and types of road, the Q50 offers 4 driving modes: standard, snow, eco and sport. Depending on your choice, the engine, the transmission, the suspension and the steering settings will automatically adjust. Moreover, with the world's first digital direction, with up to 1,000 direction adjustments per second, you'll be constantly in control and perfectly master every corner. In this price range, one is entitled to expect ultimate comfort and top-notch state-of-the-art technology, neither of which obviously disappoints. On the contrary, when it comes to reliability, the Q50 as well as the other models of the brand, including the Infiniti SUVs, like the QX30 and QX50, enjoy a better reputation and a better resale value. To test drive this magnificent sedan that is the Q50, which is more powerful than its competitor, visit us or call us to book a test drive as of today at Spinelli Infiniti. We are located on the West Island in Montreal, just minutes from Laval and Montreal East, where you can enjoy the benefits and advantageous rates of Infiniti financing.